Deus Ex: Human Revolution wrapped up with a multiple-choice finish. 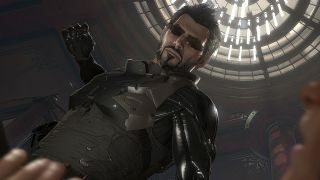 I won't spoil it for those of you who haven't yet crossed the finish line, but the relevant point is that you, as Adam Jensen, have to make a pretty big decision about the future of humanity. It all felt a bit abrupt to me, to be honest, similar to the conclusion of the original Deus Ex but less organic somehow. Mankind Divided will conclude in a different sort of fashion. "On Human Revolution, we were having it all come down to that moment where there's a button press at the end of the game, and it triggers one of the different endings. But on [Mankind Divided], we actually are looking at, 'Okay, we're going to give you different actions and different choices, and you go different paths, and how does that go?'" Mary DeMarle, the executive narrative director on Mankind Divided and lead writer on Human Revolution, said in an interview with our friends at GamesRadar. "So when you're embracing all those multifaceted, branching choices, et cetera, it gets hard enough. And then to pull in that fulfillment of what the character wants, it does get very challenging," she said. "And I can't really give you a formula for doing it, it all comes down to constant iteration, constant play, and constant feel for the character and the player experience." That's not to say that you'll be straitjacketed by your early game choices. In a separate chat with PCGamesN, Producer Olivier Proulx said there are "a few" different endings, "and obviously the choices in the last map in the game will have a big impact." The final mission, he added, is what will ultimately determine how the game ends. We took our own look at Deus Ex: Mankind Divided earlier this week, and it sounds very promising indeed—maybe even the best yet.